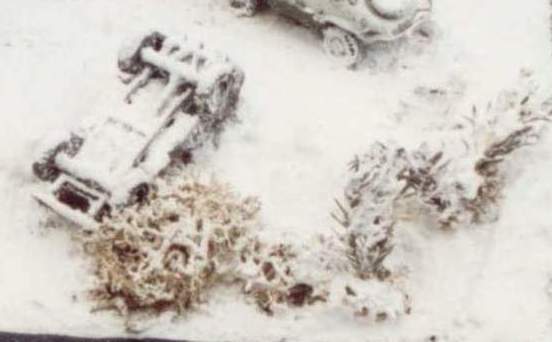 Would you like to realize your diorama, tank, soft-skin or truck covered with the snow and you have no idea how to do it? Read following description of two perfect methods. Many years of experiments passed until I have found the material for making of the best snow cover. The white-paint /in powder/ for house painters is really great material for this purpose in my opinion. First I mix the white-paint with water to get washy mash. Then I use the small paintbrush to apply prepared mash on required places. The consistence of the mash lets easy making of ”ice-caps”. There is only one problem could appear during using of this method because it can happen that the surface of the white-paint can split on same places during getting to dry sometimes. I solve this problem very simply and repaint these splits with layer of the white-paint again. I repeat the repainting until no the splits on surface. This method takes longer time to finish but the result is adequate. One of my colleagues advised me following method but I have never used it myself till now. His method is to use prepared mixture of the cooking soda and the starch /1:1/ as spreading. First you have to apply the diluted white-glue on the places where you want to realize the touch of snow and then to sprinkle these places with prepared spreading and let the glue get dry. Finally you can spray the unstuck spreading with finish to set it or you can remove it by wet paintbrush. 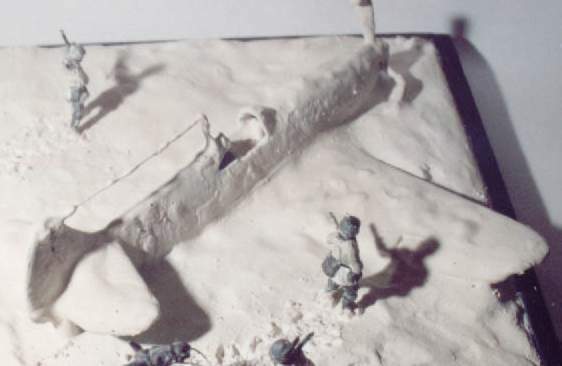 The described method is quicker then the method using the white-paint but you can’t use it if you want to realize the real snow cover let alone my favorite ”ice caps’. The use of this method is great in case you want to realize just the touch of snow or the white frost. 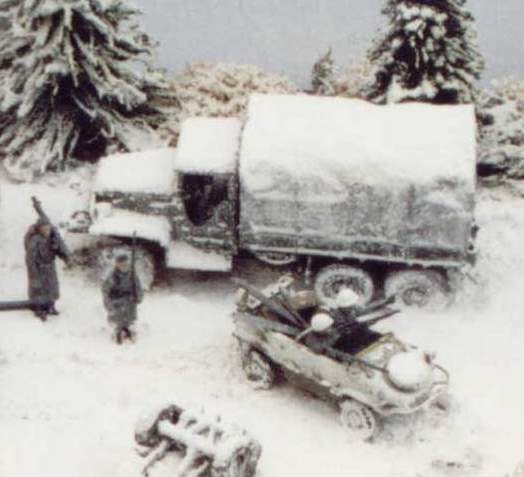 I have seen this kind snow on dioramas 1/35 and I can tell you it looks fantastic. Be sure that I will public the results of my own testing of this method when I find the time to try it.